While contemplating the Ropen-light, I suddenly remembered an article I wrote about a certain lake in Sulawesi. 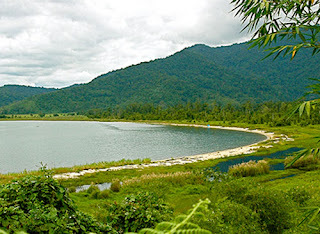 Lake Poso is located on the island of Sulawesi in the massive archipelago of Indonesia. It is the third largest lake in the country and among the deepest in the world, reaching astonishing depths of over 500 meters. I had never put much thought into it before, as I was writing for work for a travel website. I don't believe they would have been too interested in my personal Crypto-anthropologist insights. Oddly enough, I wasn't even intrigued to visit the location, as it sounded more like folklore. Anyway. I had just finished posting my article about dragons and ropen when I remembered the mysterious lights, and thought I'd look it up again. 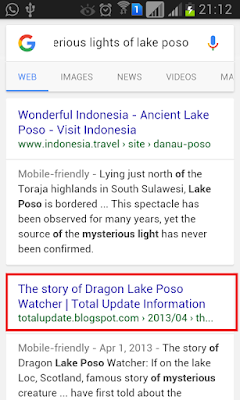 I went on Google and searched "mysterious lights of Lake Poso." Aside from my article which showed up first (yay! 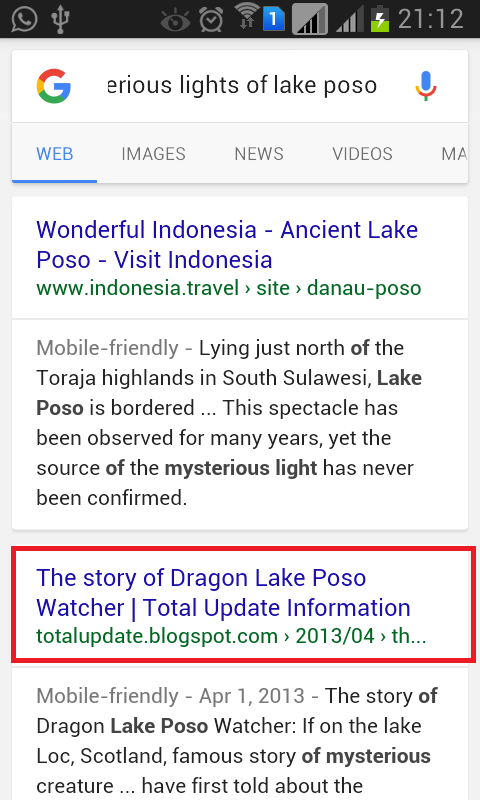 ), the next hit was this: "The Story of Dragon-lake Poso." Great! I was immediately pleased that it's not just me that suddenly thinks Lake Poso has a dragon. That story can be read here, and tells of a bright light that fishermen have observed moving beneath the water at night. Some residents suspect it is a dragon, and claim to have seen a dragon head, tail, or scales. Others believe it is a ghost. Scrolling further through the Google results, this was the one that really caught my eye! This account is a report of events that took place at Lake Poso between 1965 and 1970. Having heard many stories of the "mysterious light," several local officials went to the lake to investigate. "According to the account given by Mr. Kamah by the four above named officials, there has been some mysterious creature or phenomenon in the lake for the past five years. Until now, they have no idea as to whether this is some gigantic unknown beast or a ghost. What does seem certain is that, five years ago, a fisherman was fishing on the lake at midnight when he observed a vividly bright light at the center of the lake. At first, the man thought it must be a petromax lamp used by some other fishermen. But then he observed that the light was moving from one bank of the lake to the other and back again, at times extremely rapidly. Then, at one moment, it came to a distance of only about 100 meters from him. This terrified him so much that he went off home at once. When he first told the neighbors and villagers what he had seen, they all jeered and made fun of him. Until, about a week later, the light was observed by other fishermen. Since then, the light has been so often that it has come to be regarded as quite customary. Opinions among the populace vary greatly, however, as to what the explanation of the light could be. The local District Chief, Mr. Gintu, said: "Until 1966, I did not believe this story that the people were telling about a light in the lake. I thought it was just their superstitious talk. But, one night, at 9:00pm, as I myself was going home by boat, the sailors pointed out to me this vivid light in the middle of the lake. So I saw it for myself, and saw that it moved with extraordinary speed from one shore of the lake to another. An hour later, it approached our boat and came to a distance of only 20 meters from us. I stood watching it very attentively. The water seemed to be bubbling. It seemed to be a body surrounded by light. Although I was able to observe it at leisure, I was never able to make out its precise shape." Mr. Kamah ascertained that in the course of these five years, the behavior of the mystery light has changed. For example, whereas to begin with it was always seen in or on the lake itself, it has now begun to be seen flying around over the fields and hills around the lake and then plunging back into the lake. Moreover, there is now no longer only one light. Sometimes there are three of them." So far, this story is consistent with the Ropen of Umboi in Papua, so much that it describes a glowing creature that emerges at night. It feeds on fish and lives around water and the surrounding hills. I'll post a better account of the Umboi Ropen by and by. Also, now that I know there's something mysterious in Sulawesi... I must make plans to go. It's much easier to get to than Papua! According to eye-witness reports, the light moves from one bank to another, or around the lake “in a matter of minutes.” Let’s be conservative and assume it made it from bank to bank, rather than around the lake, in 5 minutes. Being conservative again, we’ll choose the narrow part of the lake, which measures 12.87 km. The fastest submarine was the Soviet Submarine K-222, which clocked a maximum speed of 44.85 knots, or about 83 km /hour. The fastest animal in the ocean is the Sailfish, which cuts through the water at an amazing 110km/ hour. Something which could travel 12.87 km in 5 minutes, would effectively be travelling at the ridiculous speed of 154.44 km per hour. 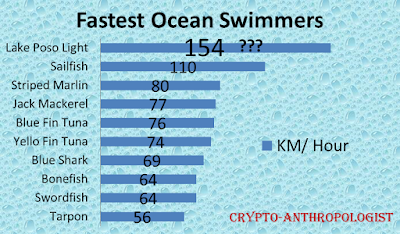 That dwarfs the Sailfish’s phenomenal speed by over 40%. And that's being conservative. My previous calculation, whereby the creature went from bank to bank in 3 minutes, would clock it at 257km/h. How's that for speed? 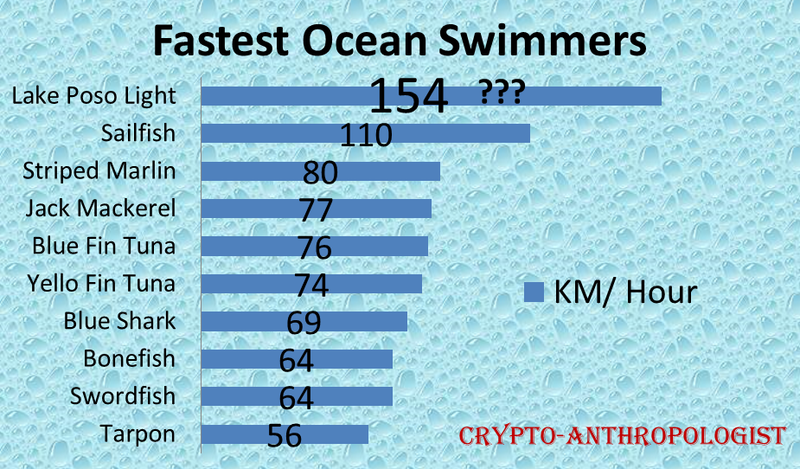 So far, no other creature's underwater speed even comes close. In other words, whether monster, magic, or man-made machine, that thing goes way too fast. A word of caution: Should you brave the waters of Lake Poso, don’t fall in. Unfortunatley, I haven't been there yet. I can't wait to go though!